Where shown, pages are found at Archive.org and are not "live" pages. from the Washington Co. ALGenWeb page shows present-day Elmore Co. to have been in the Upper Creek territory. This will be the area including Fort Jackson, extending westward from the Coosa River and bounded on the south and east by the Tallapoosa River. Creek Indian Cessions 1732-1832 from the University of Texas map collection. "The History of Tallassee", by Virginia Golden, mentioned that Tulsa OK may have been named for Talasee (Tallassee) in Elmore Co. Tulsa was settled by a band of Creek Indians known as the Lochapokas or Lachapokas who, upon arriving in OK, built a ceremonial fire under a Council Tree (right). A similar huge Council Tree (left), was located in Tuckabatchie (Elmore Co. AL) and stood until 1929. It is pictured in the "History of Tallassee". , Loachapoka (location/map), one of the oldest towns in AL is some 25 miles from Tallassee AL in Lee Co. Loachapoka history. gives some insights into the life of the Creek people in Oklahoma. OK Creek Nation USGenWeb page. Read this page and you'll see many familiar placenames. Two familiar Elmore Co. AL names appear in the text listing for the office of the Kialegee Tribal Town located in Wetumka , Okmulgee Co. OK.
Oklahoma 1890 * from the OK Creek Nation USGenWeb page showing location of the Muscogee (Creek) Nation in yellow. Oklahoma 1900 * from the McIntosh Co. OK USGenWeb page showing Creek Nation. Oklahoma 1906, 1907 * on the old Stephens Co. OK USGenWebe. The 1906 maps shows the Creek Nation; the 1907 map does not. 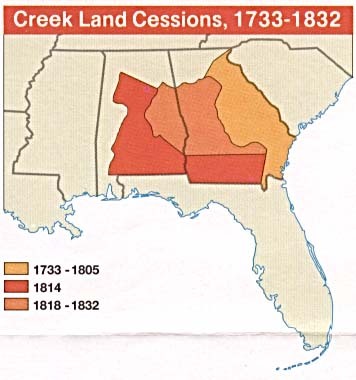 Note that the present-day map formerly shown on the Welcome to the Muscogee (Creek) Nation shows the same boundaries as that of the 1906 map.